View More In Cookware Sets. 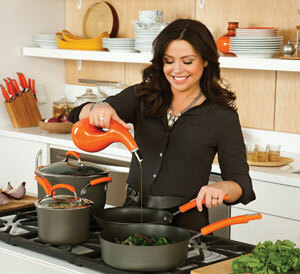 Create super-nutritious and innovative meals that are never boring with the help of Rachael Ray cookware. Create Rachael's Vegetable Cacciatore by browning vegetables in the saute pan while the accompanying whole wheat penne bubbles away in the stockpot. Or try adding a little spice to a simple lunchtime meal with a chipotle grilled cheese sandwich browned to perfection in one of the skillets. 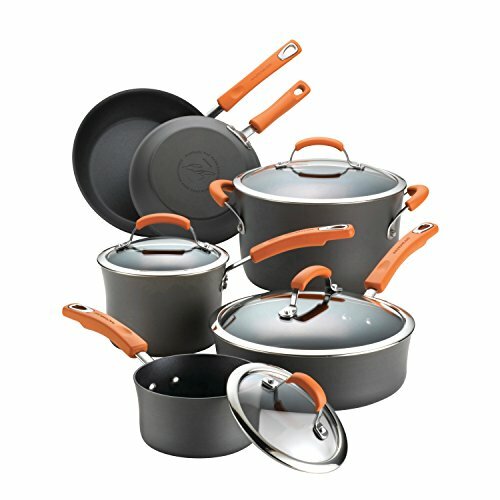 Rachael Ray Hard-Anodized cookware is the perfect combination of durability and style, and this 10-piece set certainly fits the bill. This set has all the essential pieces to make memorable meals every day. Hard-anodized construction provides even heat, helping to reduce "hot spots" that can burn food, and it�۪s coated with a durable nonstick both inside and out for exceptional food release and easy clean up. The tempered glass lids allow you to monitor your food while it cooks, keeping heat and moisture sealed in. Grippy handles feature striking orange padding for a comfortable feel. This cookware is oven safe to 350 degrees Fahrenheit and dishwasher safe for convenient, fast and simple cleanup. 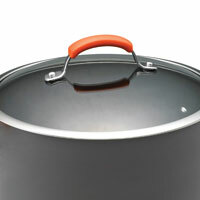 This cookware set features hard-anodized construction that heats rapidly and evenly. 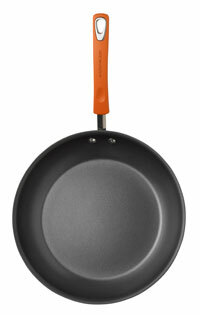 The interior is coated in durable nonstick for impeccable food release. 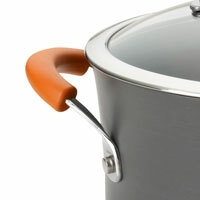 The cookware�۪s grippy handles are rubberized for comfort, and dual riveted for strength. The tempered glass lids are sturdy and form a snug seal to lock in heat and moisture. This cookware is oven safe to 350 degrees Fahrenheit. For easy cleanup, cookware is dishwasher safe. If you have any questions about this product by Rachael Ray, contact us by completing and submitting the form below. If you are looking for a specif part number, please include it with your message.